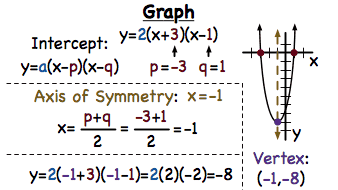 Graphing a quadratic equation in intercept form is a breeze! All the information you need is in the equation. You just need to pick it out and use it. Follow along with this tutorial to see how to take an equation intercept form and use it to find the x-intercepts, vertex, and axis of symmetry. Each quadratic equation has either a maximum or minimum, but did you that this point has a special name? In a quadratic equation, this point is called the vertex! Take a look at the vertex of a quadratic equation by watching this tutorial. What is the Axis of Symmetry of a Quadratic Function? Ever notice that the left side of the graph of a quadratic equation looks a lot like the right side of the graph? In fact, these sides are just mirror images of each other! If you were to cut a quadratic equation graph vertically in half at the vertex, you would get these symmetrical sides. That vertical line that you cut has a special name. It's called the axis of symmetry. To learn about the axis of symmetry, watch this tutorial! When you're trying to graph a quadratic equation, making a table of values can be really helpful. Before you make a table, first find the vertex of the quadratic equation. That way, you can pick values on either side to see what the graph does on either side of the vertex. Watch this tutorial to see how you can graph a quadratic equation!